Table of contents for this jackhammer page. Please, don't skip over this section. Wear your safety gear when using these tools. Minimum of good boots, gloves, goggles and ear muffs. Stout clothing helps too. The bits get very hot in operation so use caution handling them. The rest of the machine can get quite warm also. Particularly the air operated ones. Depending on what you are digging or breaking it can get dusty too. So wear a mask. It is a real pain wearing all this safety gear, and many times I see guys working without it because it is more comfortable that way. Don't do it. Apart from the obvious benefit of saving you from serious injury, safety gear saves you from heaps of minor irritations during the working day. I know from personal experience that if I don't wear my ear muffs, or ear plugs when using a noisy machine, I will feel far more tired at the end of the day, and probably have a headache as well. Nothing to do with the work, just the noise. This is my electric jack hammer, or demolition breaker as Makita calls it, that runs off ordinary household power. I always run it off a 15amp outlet and the shortest 15amp lead possible. I use it for concrete breaking and just about any sort of digging, harder than sand. With the spade bit in you can really loosen up the ground a lot easier than say a pick and shovel or a crowbar. Sometimes when auguring foundation holes with say a Bobcat a quick rattle with the jackhammer helps him to bite through a hard patch. It draws 1300W and weighs about 19 kilo with a point in it. Use ear,eye and foot protection always. Mostly I wear leather gloves. I've a couple of pointed bits for it, a chisel bit and a spade bit. They are 25mm (1")dia. It's not the biggest demolition breaker you can get, Kango do one that uses standard inch and a quarter dia. bits. The thing about selecting a concrete breaker for a particular job is that it is the weight of the machine that does the work. You shouldn't have to push down on it too much. Smaller machines for smaller jobs. Of course there are exceptions, I have used ones as big as this for cutting holes through concrete walls. Supporting it with a rope from above. Two men pushing like hell. Far more punch for a hard job. A size a bit smaller than this one can be hand held to punch out brickwork, or even reinforced blockwork OK. In my civil contracting days I ran a few air jackhammers, and to sharpen the bits I took them into our local spring works. They had a forge and did blacksmith type work. They brought the bits back to new condition. I have when stuck, sharpened them (after a fashion) with an angle grinder. A slow and tedious job. If you are hiring always get bits with sharp points, and try to get a couple extra for when you wear them down. Depending on what you are cutting, you can get clay spades (curved), straight spades, chisel points and moil points. If I am hiring, and I assume easy going, I like clay spades, but always get at least one point for unexpectedly hard sections. 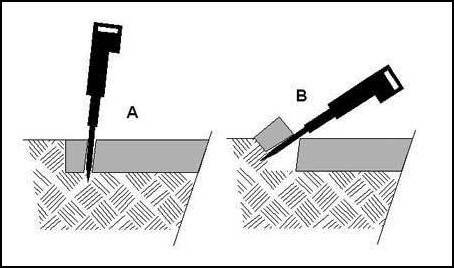 If you are starting to break up a section of concrete or dig a hole in rock, be aware that it is always easier to split of a bit at an edge. If it is very hard, do only a small bit at a time, until you create an edge. If you are starting off in the middle of a slab, chip away breaking out small bits in a small area. What you are trying to do is get through to the earth below. This is the hard bit. When you have got through, It will get a lot easier. Always split into the hole and work back from it. Most people when first using a jackhammer only do half a job. The illustration below shows a slab of concrete about to be broken up. Jackhammer - Using the tool. 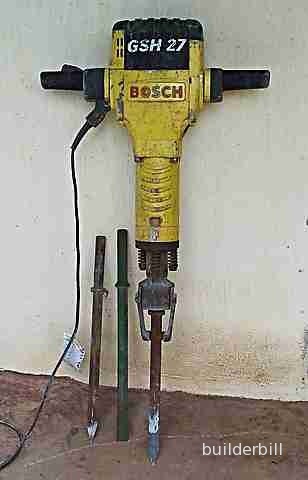 Jackhammer - As large as they go, a Bosch with standard sized 1 1/4" tools. What you should do after each bite is use the jackhammer as a crow bar to lever up and loosen the concrete (or rock or clay etc.) as in sketch "B". This makes it a lot easier to shovel out of the way. I am right handed so I tend to favour that side, so if I have broken out a chunk and then want to move over a bit, I lean into the machine with my right hip and thigh and I push the weight of the machine about with the top of my thigh, taking the weight partly off my hands. This levering the broken stuff up also makes it easier to get at any mesh or reo bar in there. Cut your reo with bolt cutters, or maybe an angle grinder with a cutting disk in it. Break up and clean up as you go along. It gives the machine a rest now and again and a clean work area is a safer work area. Here is a Bosch "Brute" that I hired a while back From Coates Hire. . My Makita was just not heavy enough to punch through some really hard concrete. It is every bit as big as the largest air operated ones. It is very heavy and fairly hard to handle until you get used to the weight. But.... it is this weight that does the work. The points and chisel bits are the standard 1 1/4" type used in air operated hammers, and the receiver locking mechanism is the same as the air operated ones use.